We both love science fiction and fantasy. For a long time we called this section of the website The Starfurry's Lair - that's now spun off into a separate section of the site. Some of our current geeky obsessions include "Game of Thrones" TV show and the upcoming "Star Wars" film (okay, that's not quite an obsession but a desperate, still-a-kid-inside hope that the new movie will be awesome). We also play role-playing games such as Pathfinder and Numenera. Kevin plays Battleground and was one of the designers of the Wuxing faction. The Blog of An Ecomics Professor at Berklee College of Music. Kevin's extensive list of Frequently Asked Questions about World War I. Coming Soon! An Archive of our Babylon 5 Fanzine contributions. Coming soon! Copyright (c) 2015 Block-Schwenk Collective.com. All rights reserved. Design based on the Altruism template by NodeThirtyThree + Free CSS Templates. 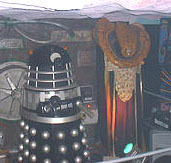 Photo of Dalek and Vorlon modified from a Flickr photo by davosmith and licensed under a Creative Commons license.